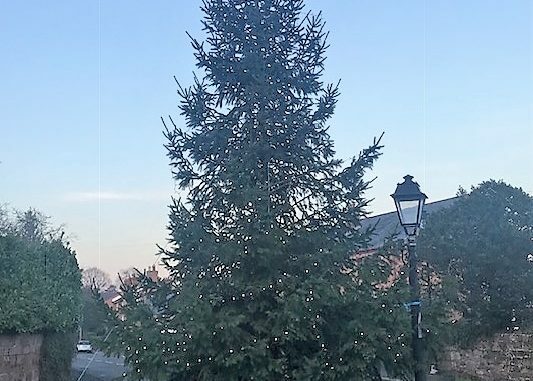 This year’s Barrow Christmas Tree, generously donated by President Nigel Heardtrumper was felled in advance by a Special Forces unit led by Brigadier H J “Tufty”Weaver (retd). 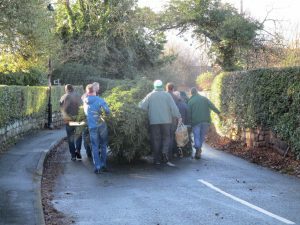 On the morning of its erection, with a count of three and a shout of “QUICK, MARCH!” from Heardtrumper, a Platoon of Barrow’s finest, fortified by bacon butties with various sauce accompaniments lifted the tree and shuffled unsteadily into the Village Rd carriageway. Arms at full stretch and staggering from side to side the men quickly gathered momentum, threatening the newly enforced 20 MPH speed limit as they exited the chicane outside the Manor House. 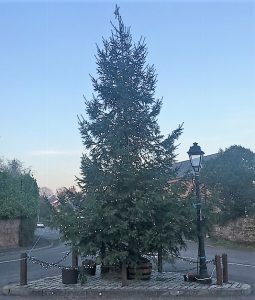 Passing villagers marvelled at the scale of the tree as Chief John Armstrong finally guided the exhausted troops to a halt. What happened next was unprecedented. The Platoon’s credentials for the job were arguably stronger than ever before. On paper this was a team with all the intellectual and practical capabilities to deal with the simple engineering problem of placing a forty foot tree in an 18 inch pot, covering it in fairy lights and raising it from the horizontal to the vertical, secured only by blue rope and half a wheelbarrow load of bricks. But Barrow’s Annual Erection doesn’t happen on paper. 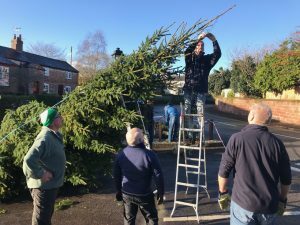 The first attempt to raise the tree was progressing well, with a ladder placed at a 45-degree angle to the trunk serving as a prop while various platoon members “took the strain” on the blue rope, humming the famous Red Army classic, “Song of the Volga Boatmen”. Reinforcements had by now arrived in the shape of Astronomer Royal Tillotson and the Late Ollie Rackham who thought he had timed his arrival from the previous day’s Xmas Dinner at Chester Rugby Club to perfection, but failed to factor in the extra time spent by the Platoon in Heardtrumper’s NAAFI kitchen on bacon butty “seconds” and general preliminary messing about. Cadet Eve Runciman showed remarkable calmness in the circumstances, having witnessed her father have his hair parted by a 1200 lb tree. She first made sure he was still conscious before posting a Facebook video, which quickly generated multiple “Likes” and smiley face emojis. Thanks to the application of approximately a mile of blue nylon rope the second attempt, accompanied by a series of alarming sways and involuntary shouts from the Chumpers was more successful. 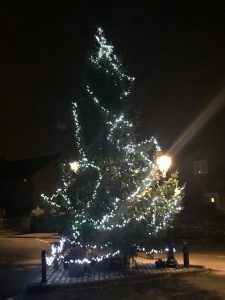 Following the traditional Easyjet Flypast by Sir William D’Arathoon, DFC and Bar and final lighting adjustments by Lance Corporal Kerry Walker various blue ropes were tied off and the Chumpers stood to admire the Tree of the Millennium as it towered over the Village Hall. 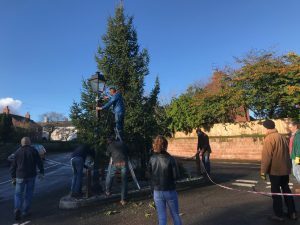 Remembering the shocking theft of a previous Barrow Christmas tree the Chumpers have hastily arranged a “Gilets Jaunes” tree protection squad, with 24 hour Hi-Viz vigils alongside the pump planned over the festive period. Liquid refreshments will be supplied by the White Horse Inn accompanied by regular supplies of mince pies donated by the Evergreen Circle. Yes, we’re taking back control. Barrow and its miraculous tree will not be moved. Health & Safety note: No Chumpers, bystanders, small children, dogs or squirrels were harmed in the course of this erection. Present but dog walking: Irish Ranger Pat “Riverdance” Walsh, Welsh Guardsman Gareth Evans.